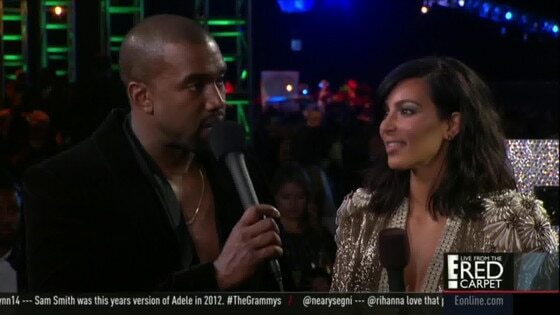 So apparently, Kanye West rushing the stage at the Grammys tonight wasn't a joke, after all. Beck's Morning Phase was named Album of the Year, a category in which the now 44-year-old veteran of the alt-rock scene topped the likes of Pharrell, Ed Sheeran, Sam Smith and Beyoncé. And, to give everyone a dose of déjà vu, Yeezy went up to the stage, making everyone (including Jay-Z and Bey) freak out about whether he was going to pull a "Kanye" again. He didn't, and everyone laughed it off. But when the rapper stopped by the E! After Party, he definitely didn't hold back and made it very clear that his little antic tonight was not just for fun, and said he thought that Beck should have given his award to Beyoncé. "I don't know what he said, all I know is if the Grammys want real artists to keep coming back, they need to stop playing with us. We ain't gonna play with them no more. 'Flawless,' Beyoncé video. Beck needs to respect artistry and he should have given his award to Beyoncé, and at this point, we tired of it," 'Ye began to say with his usual intensity. "Because what happens is, when you keep on diminishing art and not respecting the craft and smacking people in the face after they deliver monumental feats of music, you're disrespectful to inspiration and we as musicians have to inspire people who go to work every day and they listen to that Beyoncé album and they feel like it takes them to another place." He continued, "Then they do this whole promotional event, they'll run the music over somebody's speech, the artist, because they want commercial advertising. Like, no, we not playing with them no more. By the way, I got my wife, my daughter and my clothing line, so I'm not going to do nothing to put my daughter at risk but I am here to fight for creativity. That's the reason why I didn't say anything tonight. But you all know what it meant when 'Ye walks on the stage."